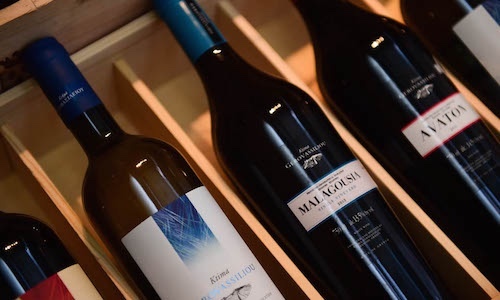 According to Greek and international wine experts, that have reviewd a great number of samples, we have completed a list of the 10 best Greek red wines, made from indigenous Greek grapes. 2008 Domaine Sigalas Mavrotragano, PGI Cyclades. 94 points. 100% mavrotragano. (50+ yrs. old vines) organic. 18 months new French oak. Regional food: Kleftiko, World: Roast leg of lamb, game, spicy casseroles, hearty pies, blue vein cheeses. Deep ruby red. Dense viscosity. Alluring aromas of oriental spice and dark fruit like plum, blackberry and black currant. Rich and gentle tannins, balanced acidity and complex aftertaste. Very complete wine, with years still to develop, not unlike a great Italian nebbiolo! Wonderfully lasting finish. Regional food: Beef tenderloin. World: game, lamb chops, organ meat (sikoti), kokoretsi, matured cheeses. Regional food: Kokoretsi, Kontosouvli, World: roast beef, spicy lamb stews, veal medallions in a red-wine sauce. Brilliantly deep ruby. Dense. Developed aroma’s of fig, prune, red currant, and medium toast. Harmoniously interacting flavors like plum, prune, black currant (cassis), vanilla, black pepper. Pleasant acidity. Medium/full body. Round fleshy texture and a lasting finish. 2008 Kir-Yianni Ramnista, PDO Naoussa, 91 points. 16 months in French / American oak 225 / 500 lt. barrels. Regional food: Kokoretsi. World: game, hearty stews, matured cheeses. Radiant dark purple. Medium viscosity. Deep, rich aroma’s of blackberry, blueberry, plum, sandalwood and black olive. Vivid acids. Complex flavors of red currant, black currant and dried tomatoes. Balanced tannins and oak. Medium/full bodied. Appealing lively texture. This wine will go a long way! Regional food: Slow Roast Greek lamb. World: dove’s breast, saddle of hare & lamb, veal liver, prime red meat. 2008 Lyrarakis Mandilari, PGI Crete, 90 points. 12 months new/old French oak, 9 months bottle. Regional food: Kokoretsi. World: prime red meats, kleftiko, game, rich matured cheeses. Deep dark purple. Dense viscosity. Thanks to very low yields and a twelve month stay on new/old French oak, this wine is a great symphony of aromas and rich flavors. In the nose ripe plums and prunes, vanilla and some cocoa. On the palate concentrated plum, black currant and some fine tannins. Regional food: Ragu of braised lamb. World: kokoretsi, lagos stifado, game, wodino me lachano, prime roasted / grilled meat, blue vein cheese. Regional food: Kleftiko. World: rich meat stews, kokoretsi, paidakia, game, rich cheeses. 2007 Domaine Skouras St. George, PDO Nemea, 89 points. Regional: food kleftiko, lagos (hare) stifado. World: kid (suckling goat), blue vein cheese. Dark purple colored. Good viscosity. Well developed aroma’s of cherry, blueberry, plum, black currant (cassis), vanilla, and tobacco. Rich flavors of blueberry, blackberry, black currant (cassis), oak, and garrigue. The body is medium/full. Volumptuous smooth texture. The wine finishes Long. Surprising! 12 months new French oak. 2008 Aidarini Single vineyard, PDO Goumenissa. 88 points. 12 months new French oak. Regional food: Slow roast goat. World: lamb, kid, red meat, game, casseroles, grilled vegetables, matured hard cheeses. Deep dark ruby. Medium+ viscosity. Spicy nose, dried medicinal herbs and prominent majoram, dried berries and a hint of plums, some old oak. Fairly juicy preserved cranberry and plum fruit, very slightly medicinal, floral traces, more earthy notes and old oak, very slightly prominent tannins, shows its origin, fairly persistent and has some backbone, very good finish. 2009 Gerovasiliou AVATON. Unrated yet! A unique wine that has a long way ahead, made from one of the most gifted Greek winemaker! Total number of bottles produced: 5.000 bottles.